With the November 6th Election Day looming, in-person early voting has concluded in North Carolina. A total of 2,040,317 votes have been cast statewide thus far. Nearly 43 percent of votes have been cast by registered Democrats, while 30 percent have been cast by registered Republicans and 27 percent by registered unaffiliated voters. A person’s party registration does not necessarily indicate their voting choices in any given race. However, these numbers can be useful in seeing trends in voter turnout for this election. Democrats enjoy the largest share of registered voters in the state, making up 38 percent of the electorate. Even so, they are over-represented in the early voting turnout by 5 percentage points. Unaffiliated voters are the second-largest voting bloc, with 32 percent of voters registered as unaffiliated. However, so far, they are underrepresented in early voting totals by 5 percentage points. To date, Republicans have had proportional turnout; they represent 30 percent of registered voters and 30 percent of votes cast. The 2018 election is a “blue moon” election in North Carolina, meaning it is a non-presidential midterm election with no U.S. Senate seat on the ballot. Under this circumstance, turnout will certainly play a large role in the election outcomes across the state. As of the end of early voting, 28.8 percent of registered voters in the state have voted in this year’s election. The party breakdown varies. Democrats have the highest turnout so far, with around 32 percent of registered Democrats having cast their ballots already. About 29 percent of Republicans utilized early voting, while only 24 percent of Unaffiliated voters have voted so far. 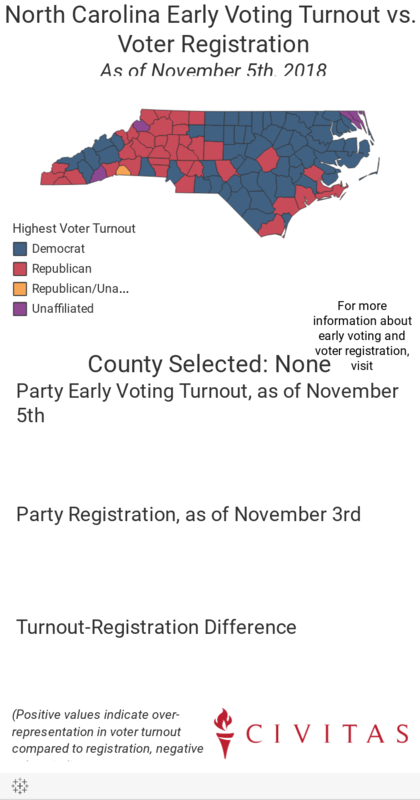 Use the interactive map below to learn more about the registration and turnout breakdown by party for all 100 counties in North Carolina. This data was collected as part of the Civitas Institute’s Carolina Elections project. Visit Carolina Election’s VoteTracker page for daily updates during early voting and a more detailed breakdown of voting across counties, Congressional districts, state legislative districts, and more.